There is a long background for this case. Although the interest here is not on the case itself, it is important to get a quick sense about why the Taiwan media have been fascinated with the many angles and possibilities in this case. On October 21, 2004, a train derailed in Taiwan. 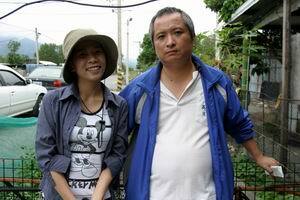 On the train were the railroad worker Lee Shuang-chuan (李雙全) and his Vietnamese wife Chen Hong-chen (陳紅琛). Both were unharmed. On June 21 2005, another train derailed in Taiwan. On the train were the railroad worker Lee Shuang-chuan (李雙全) and his Vietnamese wife Chen Hong-chen (陳紅琛). Both were unharmed. On March 17, 2006, a train running between Taitung and Pingtung derailed in southern Taiwan. On the train were the railroad worker Lee Shuang-chuan (李雙全), his Vietnamese wife Chen Hong-chen (陳紅琛) and his brother Lee Tai-an (李泰安). The Lee Brothers were unharmed, but Chen died. Lee Shuang-chuan had taken out a NT$20 million insurance policy on Chen covering "accidental death" just days before the derailment. Lee Shuang-chuan had lost more than NT$33 million on the stock market between 2001 and 2004. On March 23, 2006, Lee Shuang-chuan was found hanging from a rope tied to a tree in the backyard of his Taitung home. Since then, the media have hounded Lee Tai-an and his family. The SNG (Satellite News Gathering) vehicles are always parked out his home. What is the man to do? Well, Lee Tai-an started a blog titled "The Tai-an Rest Stop" (泰安休息站) with the sub-title "40% discount for special case squad" (專案小組六折優待). The blogger describes himself as "The Interviewee" (受訪者). His blogger profile was: "The railroad demon visitor caused the southern train to derail. Among all the passengers on that train, I (and my family) must be the most affected because I am ... the elder brother of Lee Shuang-chuan." As China Times noted, there have been 140,000 visits to the Tai-an Rest Stop already due in no small part to the coverage of the blog by mainstream media (note: none of the mainstream media would spell out the URL, so one has to use a search engine to get there). I really miss those days when no one pays attention to me. Even if I don't go out for three days in a row, nobody except my mother would be concerned. because you will have been tricked. The news that appears tomorrow will be the script that he has already written. For example, when I was interviewed by Reporter Lo of U Daily with his hand on my shoulder, his words became my opinion. Worse yet, even topics that never appeared then are written up in a lively manner. I suppose this is known as "you can murder someone without paying for the crime." After Lee Shuang-chuan is dead, who's next? I was ordered to support Taitung for a week. I did not imagine that I would encounter a big case on the first day. The demonic curse is fermenting once again that wherever the roving Apple Daily reporter goes, things happen. The telephone rung. Maybe some handsome guy wants to take me out to breakfast. So the roving reporter picked up the telephone with delight. "Go to Lee Shuang-chuan's house! Quick! I heard that the test on Chen Hong-chen's body was positive for poison!" "Positive for poison?" That's strange. How come this is different from yesterday's news? Didn't page A8 in United Daily say that "Body of Lee's wife was negative for poison"? "United Daily! So on the same day, their front page of the national edition said that there was poison, but the local edition said no." Strange. That's really strange. Other print media reported about this too, but only United said that it was positive for poison. This is the first time that I have encountered this weird contradiction of "same newspaper, different tunes" in my three years as a reporter. In order to get the news early, I did not even touch up my eyelashes before I walked out the door. This is so strange. So I hurriedly put on a fisherman's hat and left. I lost my way for about ten minutes (note: that is an improvement) before I located Lee Shuang-chuan's home. There were plenty of media waiting already. Daddy Lee faced the cameras and did not want to say too much at first. The roving reporter felt very bad so she sat in front of them and said gently: "Uncle, you have to hang on!" The aged father had experienced the sorrow of burying his own son and was now dealing with the siege and annoyance by the media. Frankly, at that moment, I did not like myself. "Miss, why am I always the last person to find out?" Daddy Lee looked at me with red eyes. Didn't they say the investigation will not be revealed to the public? I think that this is more like "not revealed to the family members!" Haven't the Pingtung prosecutor's office learned the lesson? The media are in vicious competition. "If you see a shadow, you shoot." Who cares what the facts are? Just report it first! It is better to be different from others. Even if you are the only one to get it wrong, that is still an exclusive? Daddy Lee, I beg you not to look at me like this. I really really really don't know how to comfort you. I really want to say a lot of "I'm sorry"'s to you. But what can I do? I am just as helpless as you are. Then the roving reporter saw a strange sight that she has never seen in the last seven years (four years in university and three years at work). Even Daddy Lee was comparing the newspapers, and he was comparing something from the same newspaper. How did that happen? Even I am confused. The same incident at the same place on the same day can have two opposite descriptions. What is the truth of the matter? "Miss, can you tell me which report is correct?" Sorry! Daddy Lee! I don't know either! Then the roving reporter shifted her ground and went to look up Lee Shuang-chuan's elder brother Lee Tai-an at the Taitung Funeral Home. Surprisingly, this was his first encounter with her and he immediately took a liking to her. He was very pleased with my fisherman's hat. Whenever a camera was pointed at him, he would immediately pull me aside to play the "he is Grand Justice Cheng Chung-mo and I am Wang Mei-hsin" (see Comment 200604#011) game in order to dodge the photographer.